Habitat Edge of forest, vacancy, riverside, roadside, farm area, fruit garden, etc. Date The first record was in 1952, at Shimizu Port, Shizuoka Pref. Route Accidental: With soy bean imported from USA and Canada. Impact Actually: Competition with native grasses along riverside, crop, afforestation tree, etc. Affected organism: Native plants, crop, etc. Regulation in Japan Import, transport and keeping are prohibited in Japan by the Invasive Alien Species Act. 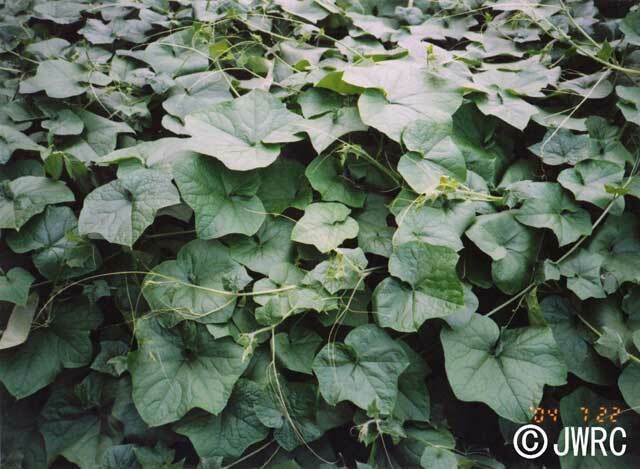 Import of Cucurbitaceae plants from areas with Tephritid fruit flies (Bactrocera cucurbitae and Ceratitis capitata) to Japan is prohibited by the Plant Protection Law. Introduced range in other countries South America, Europe, Africa, Asia, Oceania.